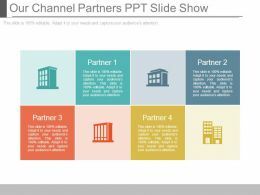 Presenting our channel partners ppt slide show. 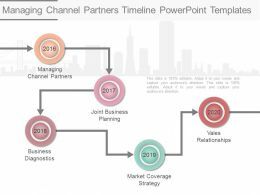 This is a our channel partners ppt slide show. This is a four stage process. 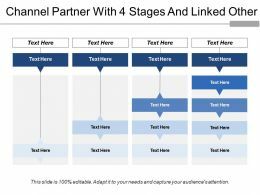 The stages in this process are partner 1, partner 2, partner 3, partner 4. 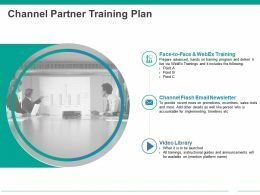 Presenting this set of slides with name - Channel Partner Training Plan Powerpoint Presentation Templates. This is a three stage process. 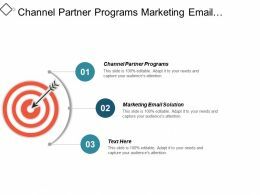 The stages in this process are Face To Face And Web ex Training, Channel Flash Email Newsletter, Library. 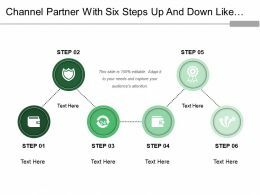 Presenting this set of slides with name - Channel Partner With Six Steps Up And Down Like Waves. This is a six stage process. 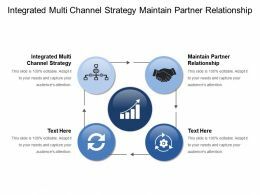 The stages in this process are Channel Partner, Partner Relationship Management, Co Branding Relationship. 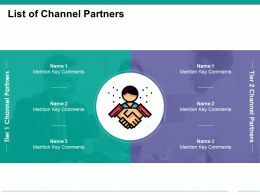 Presenting this set of slides with name - Channel Partner Support. This is a five stage process. 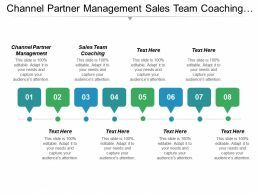 The stages in this process are Channel Partner, Channel Colleague, Channel Associate. 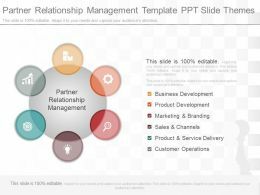 …template 3 ppt sample download. 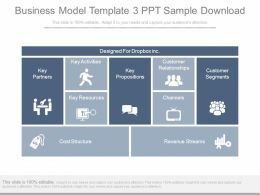 This is a business model template 3 ppt sample download. This is a nine stage process. 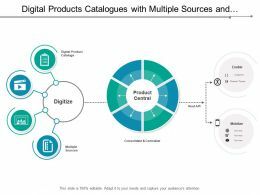 The stages in this process are key partners, key activities, key resources, cost structure, key propositions, customer relationships, customer segments, channels, revenue streams. 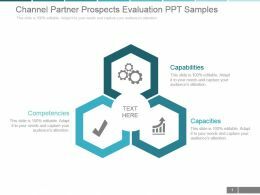 Presenting channel partner prospects evaluation ppt samples. 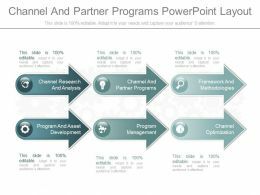 This is a channel partner prospects evaluation ppt samples. This is a three stage process. The stages in this process are capabilities, capacities, competencies. 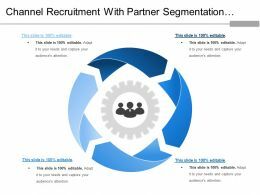 Presenting determining channel partner capability and capacity powerpoint slide. 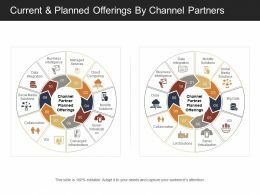 This is a determining channel partner capability and capacity powerpoint slide. This is a three stage process. The stages in this process are capabilities, capacities, competencies. 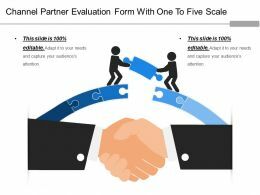 Presenting this set of slides with name - Channel Partner Evaluation Form With One To Five Scale. This is a two stage process. 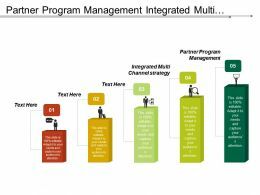 The stages in this process are Channel Partner, Partner Relationship Management, Co Branding Relationship. 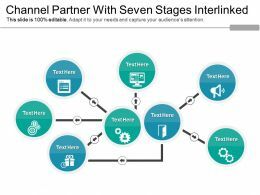 Presenting this set of slides with name - Channel Partner With Seven Stages Interlinked. This is a six stage process. 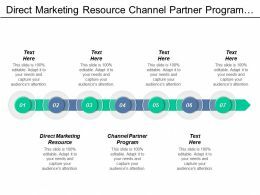 The stages in this process are Channel Partner, Partner Relationship Management, Co Branding Relationship. 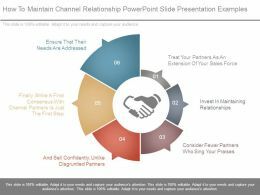 Presenting essentials for managing channel partner process powerpoint slide. 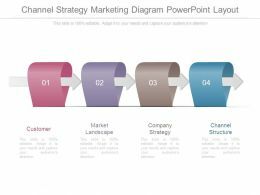 This is a essentials for managing channel partner process powerpoint slide. This is a five stage process. 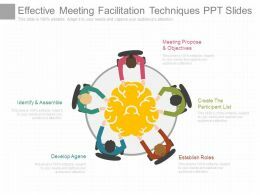 The stages in this process are recruitment, training, engagement, incentives, enablement. 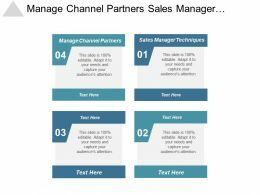 Presenting this set of slides with name - Channel Partner With 4 Stages And Linked Other. This is a four stage process. 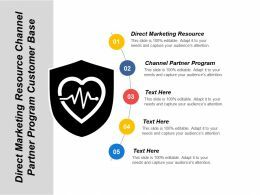 The stages in this process are Channel Partner, Partner Relationship Management, Co Branding Relationship. …of ppt. 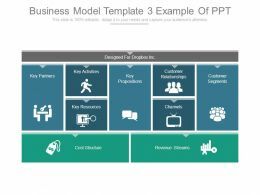 This is a business model template 3 example of ppt. This is a five stage process. 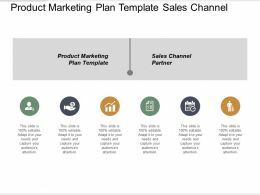 The stages in this process are designed for dropbox inc, key partners, key activities, key propositions, customer relationships, customer segments, key resources, channels, cost structure, revenue streams. 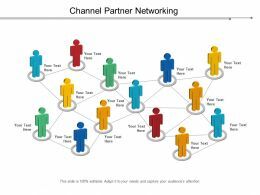 Presenting this set of slides with name - Channel Partner Networking. This is a five stage process. 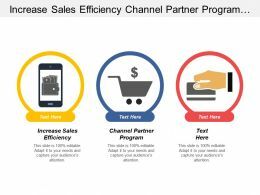 The stages in this process are Channel Partner, Channel Colleague, Channel Associate. 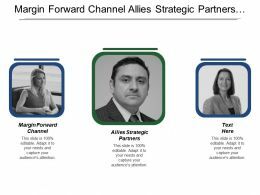 Presenting this set of slides with name - Vendor And Channel Partners. This is a eight stage process. 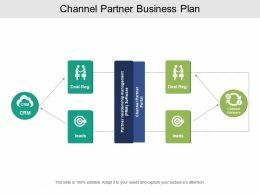 The stages in this process are Channel Partner, Channel Colleague, Channel Associate. 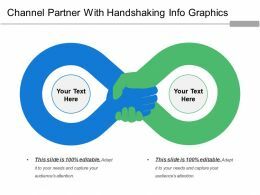 Presenting this set of slides with name - Channel Partner With Handshaking Info Graphics. This is a two stage process. 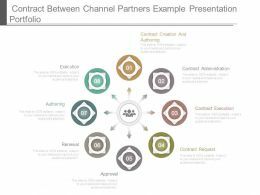 The stages in this process are Channel Partner, Partner Relationship Management, Co Branding Relationship. 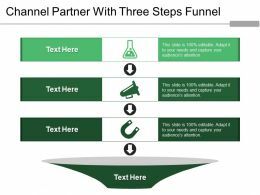 Presenting this set of slides with name - Channel Partner With Three Steps Funnel. This is a three stage process. 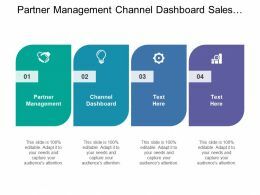 The stages in this process are Channel Partner, Partner Relationship Management, Co Branding Relationship. 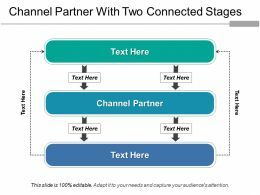 Presenting this set of slides with name - Channel Partner With Two Connected Stages. This is a three stage process. 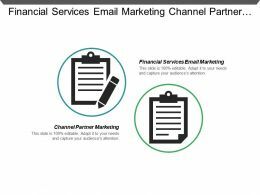 The stages in this process are Channel Partner, Partner Relationship Management, Co Branding Relationship. 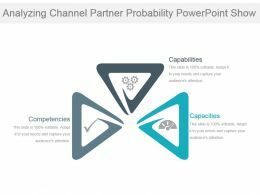 Presenting analyzing channel partner probability powerpoint show. 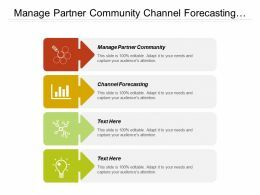 This is a analyzing channel partner probability powerpoint show. This is a three stage process. The stages in this process are competencies, capabilities, capacities. 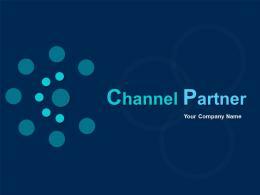 Presenting channel partner management process powerpoint slide background. 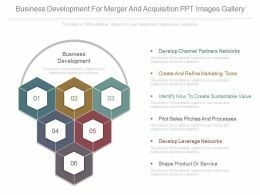 This is a channel partner management process powerpoint slide background. This is a six stage process. The stages in this process are demographics, psychographics, biographic, relationships, motivation, modality. 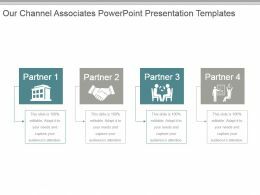 Presenting measure potential channel partners ppt design templates. 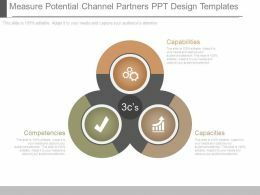 This is a measure potential channel partners ppt design templates. This is a three stage process. The stages in this process are capabilities, capacities, competencies. 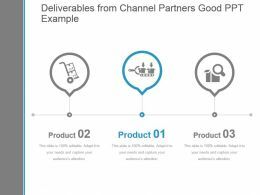 Presenting deliverables from channel partners good ppt example. This is a deliverables from channel partners good ppt example. This is a three stage process. 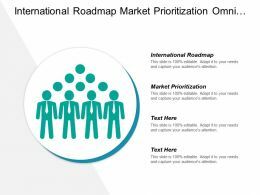 The stages in this process are business, icons, process, roadmap, marketing, strategy. 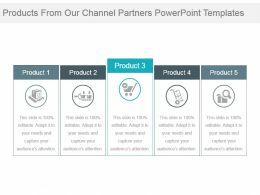 Presenting products from our channel partners powerpoint templates. 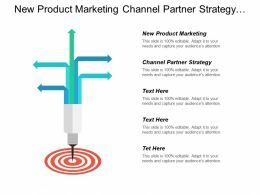 This is a products from our channel partners powerpoint templates. This is a five stage process. The stages in this process are business, strategy, marketing, success, icon. Presenting this set of slides with name - Channel Partner With Strategic Planning Field Engagement Partner. This is a four stage process. 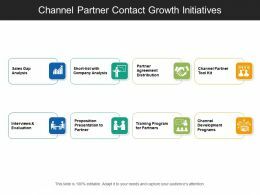 The stages in this process are Channel Partner, Partner Relationship Management, Co Branding Relationship. 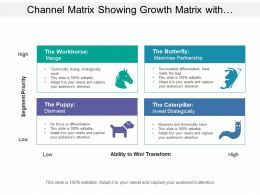 Presenting this set of slides with name - Channel Matrix Showing Growth Matrix With Channel Partner. This is a four stage process. 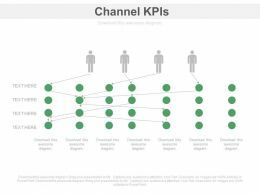 The stages in this process are Channel Matrix, Channel Stats, Channel State Information. 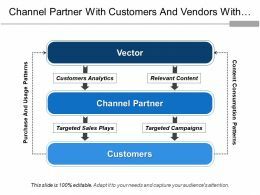 Presenting this set of slides with name - Channel Partner With Customers And Vendors With Content Consumption Pattern. This is a three stage process. 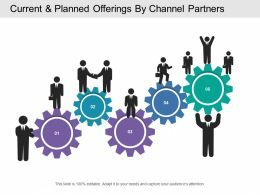 The stages in this process are Channel Partner, Partner Relationship Management, Co Branding Relationship. 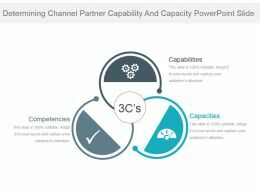 Presenting assessing channel partner capabilities and competencies ppt icon. 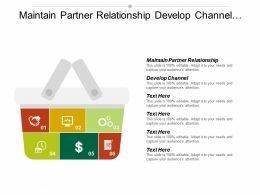 This is a assessing channel partner capabilities and competencies ppt icon. This is a three stage process. The stages in this process are competencies, capabilities, capacities. 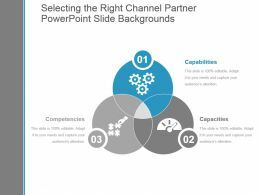 Presenting selecting the right channel partner powerpoint slide backgrounds. This is a selecting the right channel partner powerpoint slide backgrounds. This is a three stage process. 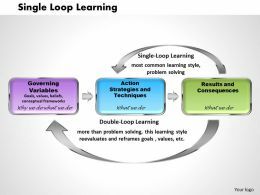 The stages in this process are capabilities, capacities, competencies. 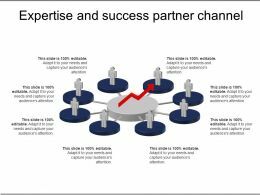 Presenting this set of slides with name - Expertise And Success Partner Channel. This is a eight stage process. 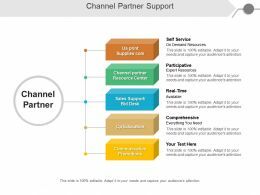 The stages in this process are Channel Partner, Channel Colleague, Channel Associate. 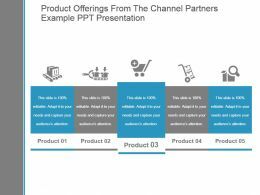 Presenting product offerings from the channel partners example ppt presentation. 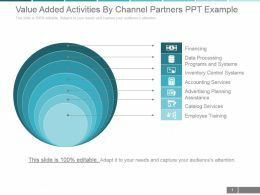 This is a product offerings from the channel partners example ppt presentation. This is a five stage process. The stages in this process are business, icons, marketing, management, success. Presenting this set of slides with name - Channel Partner Central And Manufacturer Portal With Marketing And Channel Operations. This is a six stage process. 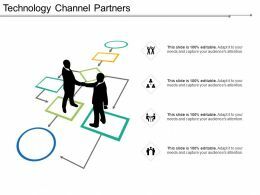 The stages in this process are Channel Partner, Partner Relationship Management, Co Branding Relationship. 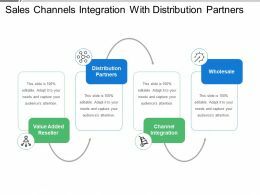 Presenting this set of slides with name - Sales Channels Integration With Distribution Partners. This is a four stage process. 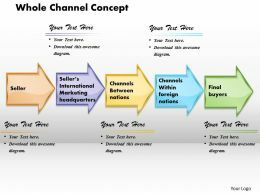 The stages in this process are Sales Channels, Marketing Channel, Sales Medium. 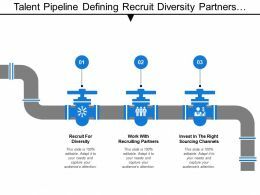 Presenting this set of slides with name - Talent Pipeline Defining Recruit Diversity Partners And Sourcing Channels. This is a three stage process. The stages in this process are Talent Pipeline, Strength Pipeline, Ability Pipeline. 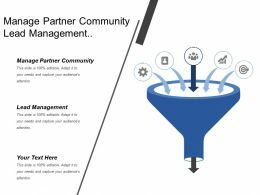 Presenting this set of slides with name - Partner Relationship Management. This is a five stage process. 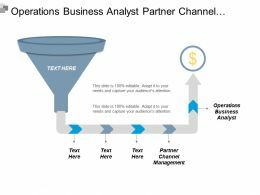 The stages in this process are Channel Partner, Channel Colleague, Channel Associate. 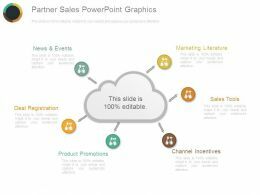 Presenting partner sales powerpoint graphics. 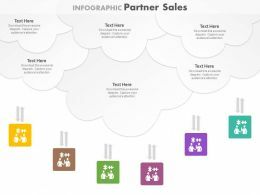 This is a partner sales powerpoint graphics. This is six stage process. 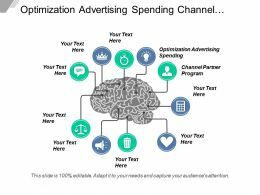 The stages in this process are marketing literature, sales tools, channel incentives, product promotions, deal registration, news and events. 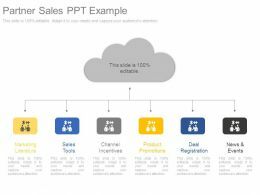 Presenting partner sales ppt example. 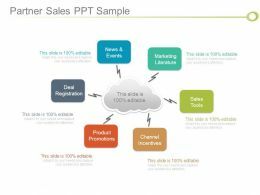 This is a partner sales ppt example. This is a six stage process. 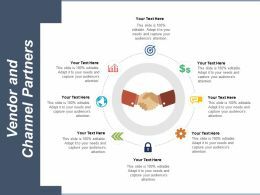 The stages in this process are Marketing Literature, Sales Tools, Channel Incentives, Product Promotions, Deal Registration, News and Events. 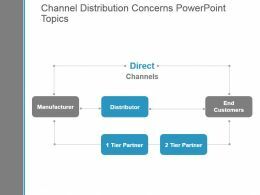 Presenting channel distribution concerns powerpoint topics. 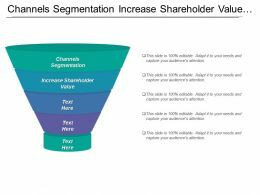 This is a channel distribution concerns powerpoint topics. This is a two stage process. 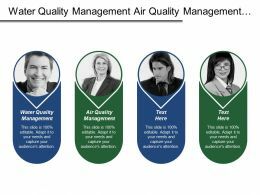 The stages in this process are channels, manufacturer, distributor, end customers, tier partner. 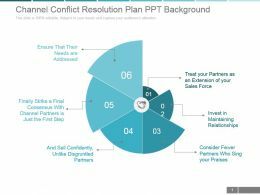 …their needs are addressed, finally strike a final consensus with channel partners is just the first step, and sell confidently, unlike disgruntled partners, treat your partners as an extension of your sales force, invest in maintaining relationships, consider fewer partners who sing your praises. 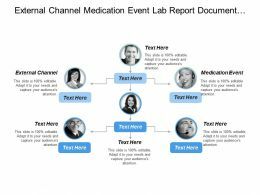 Presenting this set of slides with name - Channel Evaluation Four Stages With Market Scan Recommendations. This is a four stage process. 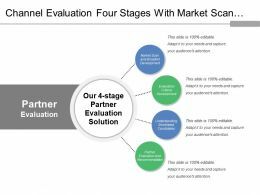 The stages in this process are Channel Partner, Partner Relationship Management, Co Branding Relationship. 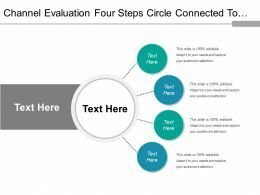 Presenting this set of slides with name - Channel Evaluation Four Steps Circle Connected To Each Other. This is a four stage process. 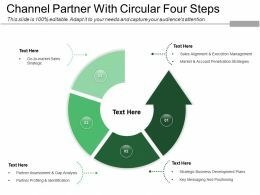 The stages in this process are Channel Partner, Partner Relationship Management, Co Branding Relationship. 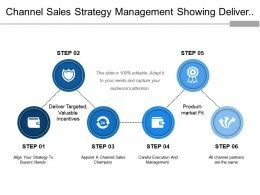 Presenting this set of slides with name - Channel Sales Strategy Management Showing Deliver Target Product Market Fir. This is a six stage process. 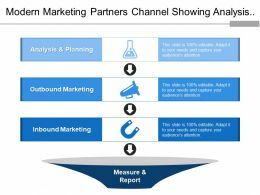 The stages in this process are Channel Partner, Partner Relationship Management, Co Branding Relationship. Presenting this set of slides with name - Marketing Channel For Consumer Products Showing Direct Retail Wholesale Agent. This is a four stage process. 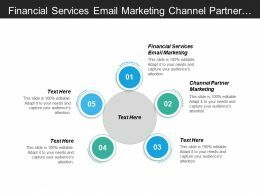 The stages in this process are Channel Partner, Partner Relationship Management, Co Branding Relationship. 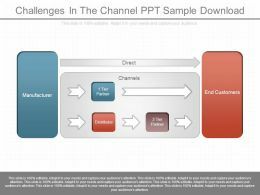 Presenting challenges in the channel ppt sample download. 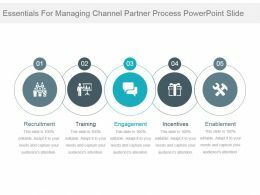 This is a challenges in the channel ppt sample download. This is a three stage process. 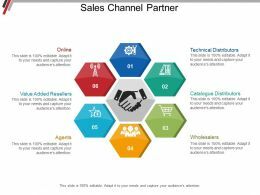 The stages in this process are manufacturer, channels, direct, end customers, distributor, tier partner. 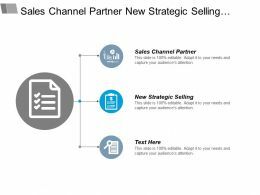 …their needs are addressed, finally strike a final consensus with, channel partners is just the first step, and sell confidently, unlike disgruntled partners, consider fewer partners who sing your praises, invest in maintaining relationships, treat your partners as an extension of your sales force. 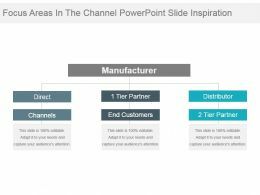 Presenting our channel associates powerpoint presentation templates. 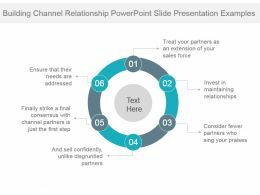 This is a our channel associates powerpoint presentation templates. This is a four stage process. The stages in this process are partner, icons, business, management, success, presentation. Presenting contribution from the channel associates powerpoint graphics. This is a contribution from the channel associates powerpoint graphics. This is a three stage process. The stages in this process are business, strategy, marketing, icon, process. 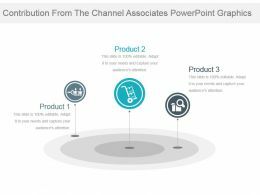 Presenting product offerings by channel associates powerpoint graphics. 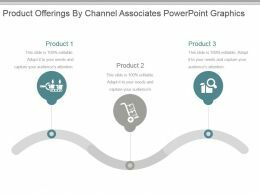 This is a product offerings by channel associates powerpoint graphics. This is a three stage process. The stages in this process are product, icons, marketing, strategy, business, success. 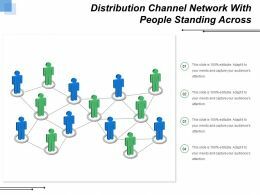 Presenting this set of slides with name - Distribution Channel Network With People Standing Across. This is a four stage process. The stages in this process are Distribution, Spread, Classification. …not deter its quality. 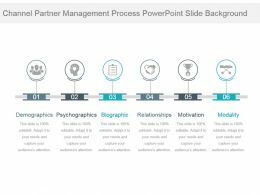 Presentation slides are fully compatible with Google slides. Adaptable designs as can be transformed into JPG and PDF format. 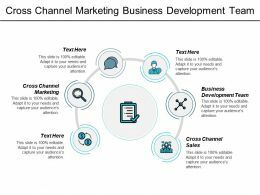 Useful for marketing industry experts and professionals.The stages in this process are customer, market landscape, company strategy, channel structure.